To Norseland on the "Ships starting with N" page. Launched as Falstria on March 12-1914, delivered to A/S Det Østasiatiske Kompanie, Copenhagen on May 31-1915. Built by Harland & Wolff Ltd., Yard No. 451 (Irvine yard of Mackie & Thomson Ltd., Govan, Glasgow). 2 x 6 cyl., 4-stroke Single Acting engines totalling 2250 ihp (1650 bhp) by Barclay, Curle & Co., Glasgow, 10 knots. Sold in Sept.-1936 to A/S Olymp (Einar Lange, Oslo), Panama and renamed Olymp. Sold again in 1938 to Yngvar Hvistendahl, Tønsberg and renamed Matros. Sold in 1940 to Norseland S.S. Co. Inc. (Odd Godager, Oslo), Panama, renamed Norseland. Norseland is listed in Convoy HG 30 from Gibraltar to the U.K. on May 15-1940. She was bound for London and had station 73 of the convoy. 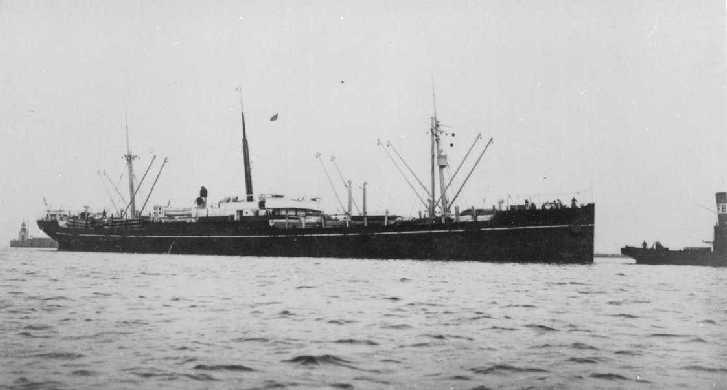 She was sold again on Dec. 11-1941 to Schweizerische Eidgenossenschaft, handed over to Swiss War Transport Office (Honegger & Ascott, London), Basel, renamed Saentis. Sold on Febr. 12-1947 to Nautilus A.G. (Glarus), Lugano, same name. Sold in 1954 to Keller Shipping Ltd., Basel. Sold on Sept. 30-1963 to Italy for breaking up, arriving Vado di Ligure on Dec. 20-1963; demolition commenced on the 23rd. Back to Norseland on the "Ships starting with N" page. The text on this page was compiled with the help of: The majority of info is from the website Swiss Ships, with permission.